Flat Tops is Colorado's second largest wilderness. 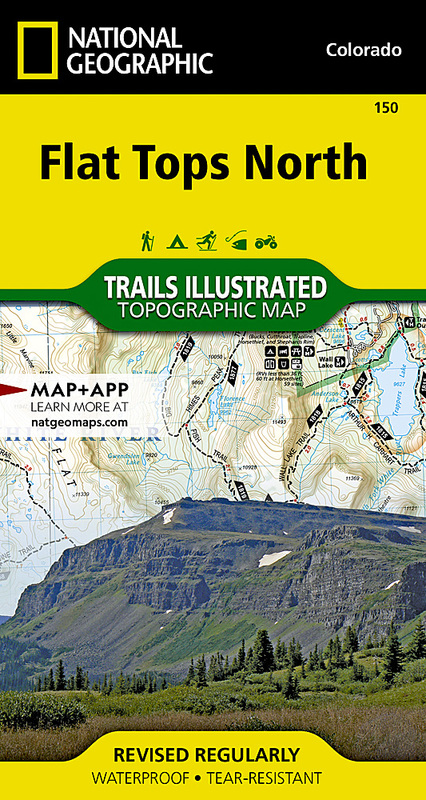 National Geographic's Trails Illustrated map of Flat Tops North delivers unmatched detail and valuable information to assist you in your exploration of this scenic region of flat-topped mountains, subalpine terrain, alpine tundra, and hundreds of streams, lakes, and ponds. Created in partnership with local land management agencies, this expertly researched map features key areas of interest including Oak Ridge State Wildlife Area; North Fork White River; Flat Tops Trail Scenic Byway; Meeker, Trappers Lake; and Yamcolo and Stillwater reservoirs. With miles of mapped trails highlighted according to use, this map can guide you off the beaten path and back again. The clearly marked trails include mileage between intersections. The map base includes contour lines, shaded relief, and elevations for summits, passes, and many lakes. Some of the many recreation features shown include campgrounds, fishing areas, whitewater access, boat launches, trailheads, interpretive sites, horse corrals, picnic areas, and more. Survival tips and agency contact info is provided as well. Other features found on this map include: Flat Tops Wilderness, Routt National Forest, White River National Forest.